Playing the Rapture is an original hour-long performance work that examines American evangelical belief in the Rapture—a moment when every true Christian will suddenly vanish from the earth, leaving the rest of humankind to struggle through a period of extreme tribulation. It explores the social implications of both "end times" theology and the scientific pursuit of escape from a dying planet. —writing the script (with contributions by John Mellies); creating the machinima videos; co-creating the set design (with Robert Allen); and programming the show controllers in Max/MSP/Jitter. Playing the Rapture revolves around two characters who are playing a computer game set in a post-Rapture world. Designed by one of them, the game posits a choice for those who have been left on earth between conversion to Christianity and joining the Antichrist. As the two gamers beta-test this new creation, they engage in an intense struggle over everything from the rules of the game to the problem of belief. At the crisis of their contest, an intervention by the philosopher Ludwig Wittgenstein changes the dynamics of the piece. 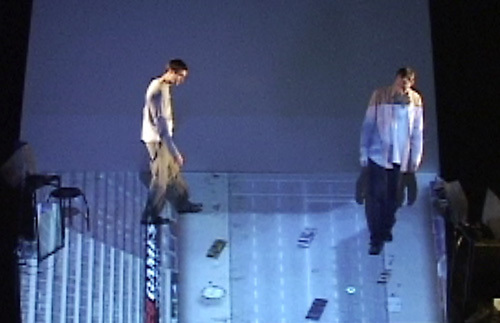 Playing the Rapture was performed by Jay Wallace and John Mellies and directed by Robert Allen. 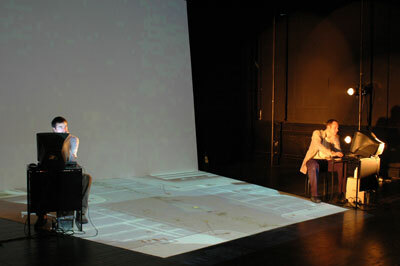 It premiered at the Baltimore Theatre Project in March 2008. 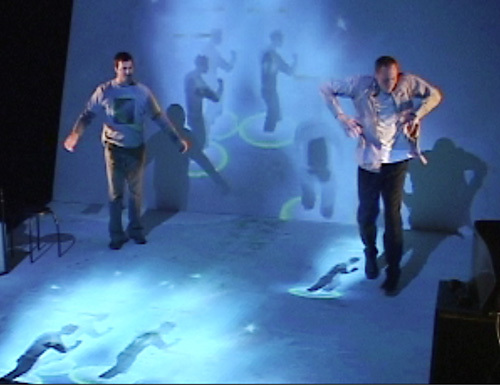 I designed the environment for this piece to be almost entirely virtual—primarily large-scale projections of the game world the two gamers are testing. 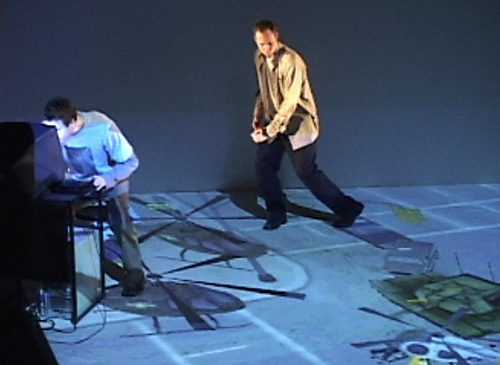 The wall and floor projection areas created two intersecting trapezoids that constituted the play space of both game and performance. These projections were controlled through a pair of Max/MSP/Jitter patches that I wrote. Most of the two dozen performance projections were machinima videos that I created using an actual computer game set in a post-Rapture world. Entitled "Left Behind: Eternal Forces", and based on a series of best-selling novels of the same title, this game has a very interesting history of controversy around its version of Christian eschatology. In the course of researching and playing this game in order to create the machinima videos, I integrated aspects of its history into the performance script.